What's virtual reality games? 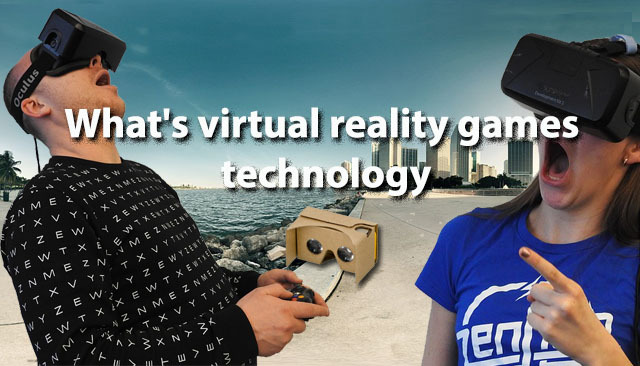 Yes, virtual reality game is part of virtual technology. Virtual reality technology simply called VR technology. The real definition of VR comes, naturally, “virtual” and “reality”. Virtual means something close to a person and reality means what happens in our real life. So the term virtual reality means simply “near reality”. So it is what happens in our real life near a person. It’s like watching television or watching a film in a theatre. Uses in the virtual reality technology we can watch Television or films in the theatre without turn on the TV or without went to the cinema. How is that possible? For an example we cannot go to Taajmahal, Paris or galaxy within minute. But we can get experience through virtual reality technology, how exactly look like in our real life if we were Taajmahal or Paris or in the galaxy. Virtual reality is the term used to describe a 3d, computer generated environment which can be explored and cooperate with by a person. Finally VR is the creation of a virtual environment presented to our senses in such a way that we experience it as if we were really there. How can I get experience with VR technology? Yes, it’s does not cost much. Get a latest smart phone with gyroscope, magnetometer sensors and NFC available. When you got ordered Google cardboard fix it using introduction. Bring your phone and download Google cardboard app from Google play store or Apple store. This Google cardboard is not much get you into reality environment. If you want more reality and accurate tracking experience, than buy a PC VR device or comfortable Smart phone VR headset. Virtual reality games is a application for PC, Smart phone, and PlayStation devices. Using these application a person can experience being in a 3D environment and cooperate with vr environment during a game.